Blowout Sale! Save 51% on the Rowling Large Jewellery Box Watch Bracelets Rings Earring Cufflinks Women Handbag (BROWN) by Rowling at Social Seeker. Hurry! Limited time offer. Offer valid only while supplies last. 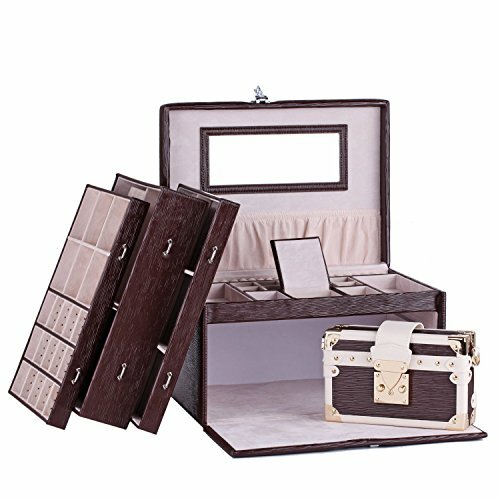 LARGE JEWELLERY BOX JEWELRY WATCH BEADS BRACELETS RINGS EARRINGS PINS CUFFLINKS STORATE DISPLAY CASE ZG243 Pls Take Noted The Jewelry Not Included!!! View More In Jewelry Armoires - Page 9. LARGE JEWELLERY BOX JEWELRY WATCH BEADS BRACELETS RINGS EARRINGS PINS CUFFLINKS STORATE DISPLAY CASE ZG243 Pls Take Noted The Jewelry Not Included!!! - Size: 33.5x24.5x19cm (LxWxD) - Color: Black Crosshatch Pattern, Brown Crosshatch Pattern, White Crosshatch Pattern - With 3 Drawers - First Drawer: 15 Slots (4.5x4x2cm) with Removable Earrling Storage Dividers and 6 Middle Side Slots (7x6.5x2cm) - Second Drawer: 6 Large Removable Slots (9.5x10x2cm) - Third Drawer: 1 Large Slots (13.5x20.5x6cm) with a Fashion Women's Bag, 1 Large Slots for Bracelets or Nail Polish (15.5x11x6cm), 3 Slots for Watches (Each Slot Size: 4.5x9x4.5cm) - With a Mirror and a Pouch on Top Lid - Strong Handle on Top Lid - Sliver Color Lock and Accessory, with Lock Instruction inside Case - Safe Package: 1PC/PP Bag/Mail Order Box Details of Small Fashion Shoulder Clutch Bag Its small but structured shape means that this bag moves gracefully between day and evening. - Size: 19x5x12 cm - Material: Faux Leather Crosshatch Pattern & Soft Velvet Lining - Removable Adjustable Faux Leather Strap - With a Pouch inside - Magnetic Closure - Gold Metallic Color Accessories and S-Lock Pls take noted that due to lighting effects and monitor's brightness and ect., the color tone of the website's photo and the actual item could be slightly different! - Details of small Fashion Shoulder Clutch Bag,Its small but structured shape means that This Bag moves gracefully between day and evening. If you have any questions about this product by Rowling, contact us by completing and submitting the form below. If you are looking for a specif part number, please include it with your message.